Heat Pipes are often called Heat Superconductors! In this engineering article we’ll talk about heat pipes, how they are made, compare them with heat sinks, and talk about performance in various thermal management applications. Heat pipes are transport mechanisms that can carry heat fluxes ranging from 10 W/cm2 to 20 KW/cm2 at a very fast speed. Essentially, they can be considered heat super conductors. Heat pipes can be used either as a means to transport heat from one location to another, or as a means to isothermalize the temperature distribution. The first heat pipe was tested at Los Alamos National Laboratory in 1963. Since then, heat pipes have been used in such diverse applications as laptop computers, spacecraft, plastic injection molders, medical devices, and lighting systems. 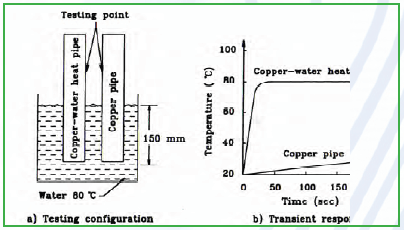 The operation of a heat pipe is described in Figure 1. A heat pipe has three sections: the evaporator, the adiabatic, and the condenser. The interior of the pipe is covered with a wick, and the pipe is partially filled with a liquid such as water. When the evaporator section (Le) is exposed to a heat source, the liquid inside vaporizes and the pressure in that section increases. The increased pressure causes the vapor to flow at a fast speed toward the condenser section of the heat pipe (Lc). 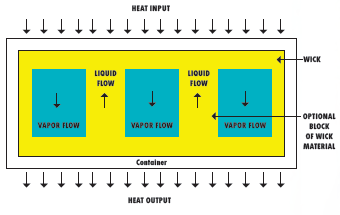 The vapor in the condenser section loses heat to the integral heat sink and is converted back to liquid by the transfer of the latent heat of vaporization to the condenser. The liquid is then pumped back to the evaporator through the wick capillary action. The middle section of the heat pipe (La), the adiabatic portion, has a very small temperature difference. Figure 2 shows the pressure drop distribution inside a heat pipe. 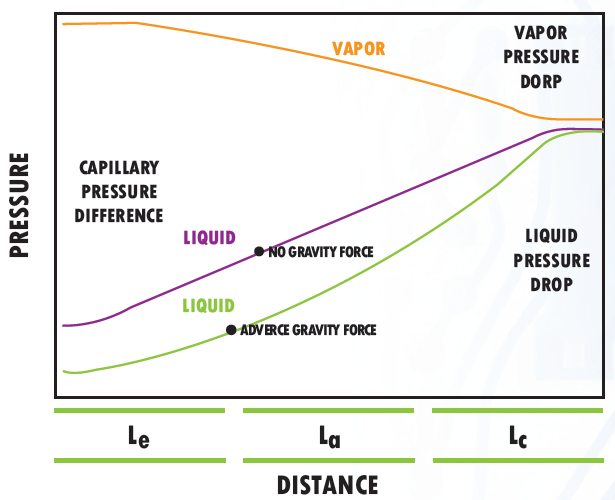 In order for the capillary force to drive the vapor, the capillary pressure of the wick should exceed the pressure difference between the vapor and the liquid at the evaporator. The graph also shows that if the heat pipe is operated against the force of gravity, the liquid undergoes a larger pressure drop. The result is less pumping of the wick with reduced heat transfer. The amount of heat transfer decrease depends on the particular heat pipe. Metallic pipe: The metal can be aluminum, copper or stainless steel. It must be compatible with the working fluid to prevent chemical reactions, such as oxidation. Working fluid: Several types of fluids have been used to date. These include methane, water, ammonia, and sodium. Choice of fluid also depends on the operating temperature range. Wick: The wick structure comes in different shapes and materials. Figure 3 shows the profiles of common wick types: axial groove, fine fiber, screen mesh, and sintering. Each wick has its own characteristics. For example, the axial groove has good conductivity, poor flow against gravity, and low thermal resistance. Conversely, a sintering wick has excellent flow in the opposite direction of gravity, but has high thermal resistance. 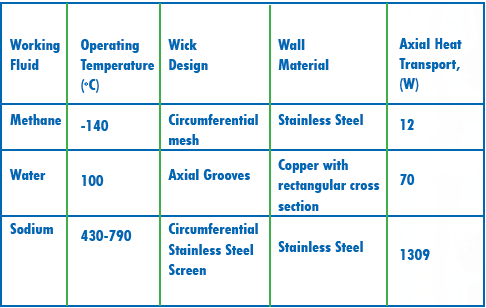 Table 1 shows experimental data for the operating temperature and heat transfer for three different types of heat pipes . Boiling Limit: High heat fluxes can cause dry out. A heat pipe has an effective thermal conductivity much larger than that of a very good metal conductor, such as copper. 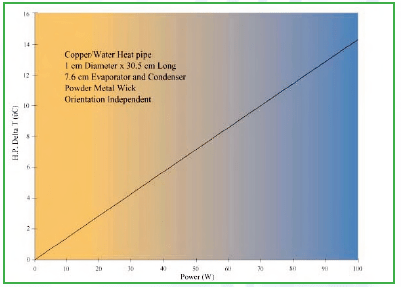 Figure 4 shows a copper-water heat pipe and a copper pipe dipped into an 80oC water bath. Both pipes were initially at 20oC temperature. The heat pipe temperature reaches the water temperature in about 25 seconds, while the copper rod reaches just 30oC after 200 seconds. However, in an actual application when a heat pipe is soldered or epoxied to the base of a heat sink, the effective thermal conductivity of the heat pipe may be drastically reduced due to the extra thermal resistances added by the bonding. A rule of thumb for the effective thermal conductivity of a heat pipe is 4000 W/mK. Figure 4. Experiment Comparing Speed of Heat Transfer Between a Heat Pipe and a Copper Pipe . Heat pipe manufacturers generally provide data sheets showing the relationship between the temperature difference and the heat input. Figure 5 shows the temperature difference between the two ends of a heat pipe as a function of power . There are many heat pipe shapes in the market, but the most common are either round or flat. Round heat pipes can be used for transferring heat from one point to another. They can be applied in tightly spaced electronic components, such as in a laptop. Heat is transferred to a different location that provides enough space to use a proper heat sink or other cooling solution. 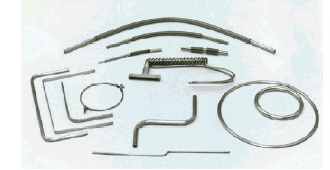 Figure 6 shows some of the common round heat pipes available in the market. Figure 6. Typical Round Heat Pipes in the Market. 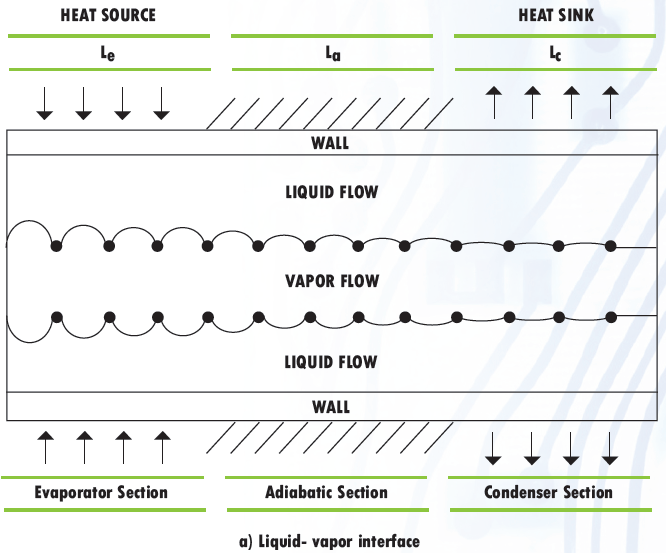 Flat heat pipes (vapor chambers) work conceptually the same as round heat pipes. Figure 7 shows a flat pipe design, they can be used as heat spreaders. When the heat source is much smaller than the heat sink base, a flat heat pipe can be embedded in the base of the heat sink, or it can be attached to the base to spread the heat more uniformly on the base of the heat sink. Figure 8 shows some common flat heat pipes. Although a vapor chamber might be helpful in minimizing spreading resistance, it may not perform as well as a plate made from a very high conductor, such as diamond. A determining factor is the thickness of the base plate. Figure 9 shows the spreading resistance for 80 x 80 x 5 mm base plate of different materials with a 10 x 10 mm heat source. The vapor chamber has a spreading resistance that is better than copper, but worse than diamond. However the price of the diamond might not justify its application. 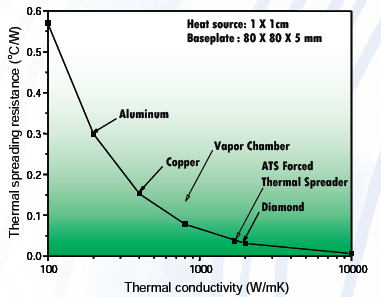 Figure 9 also includes the spreading resistance from the ATS Forced Thermal Spreader (FTS), which is equal to that of diamond at a much lower cost. The FTS uses a combination of mini and micro channels to minimize the spreading resistance by circulating the liquid inside the spreader. Heat pipes have a very important role in the thermal management arena. With projected lifespans of 129,000-260,000 hours (as claimed by their manufacturers), they will continue to be an integral part of some new thermal systems. However, with such problems as dry out, acceleration, leakage, vapor lock and reliable performance in ETSI or NEBS types of environments, heat pipes should be tested prior to use and after unsatisfactory examination of other cooling methods have been explored. 1. Faghri, A. Heat Pipe Science and Technology Taylor & Francis, 1995. 2. Thermacore Internation, Inc., www.thermacore.com. Originally written and posted by ATS, for more information, or to contact a representative, visit ATS’ page on the Ismosys website.